Reflection–While it’s taken a few years of gathering research to put together this model (many many hours of reading! ), I have to hold off my judgement of it until I see, with my own research in-world, whether or not it holds up in actual ongoing tutorial centers that have trained thousands of people in the virtual world. From my Chapter 2 description of the VEBEP Model. “It has 5 parts. 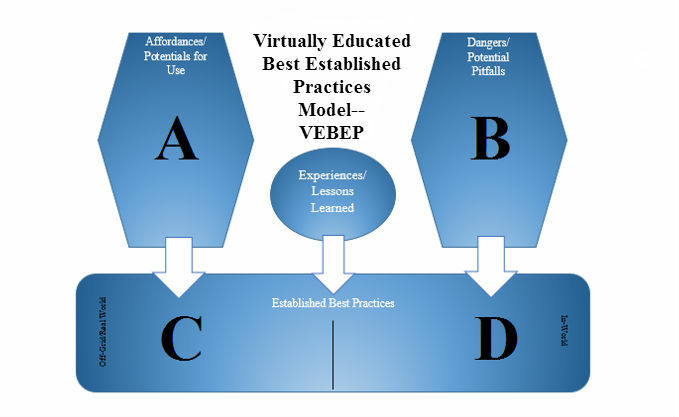 The top three, affordances/potentials for use (A) and dangers/potential pitfalls (B) combine with experiences/lessons learned to form the established best practices for off-grid (C) and inworld (D). There is no way that a virtual tutorial or educational area could cover everything in the model—in fact, that would be quite confusing and overwhelming for users. However, there has yet to be enough data gathered to find a “saturation point,” or the top number of elements to use above which diminished returns begins to occur. This is also a “living model,” changing as more and more information is gained. Section A houses the list of affordances or potential uses of a virtual world for education. Listed, these would include: synchronous real-time meetings, classes and consultations; money-saving virtual conferences/presentations; role-play; machinima—computer generated short films; building learning objects; developing social skills; playing multi-player games; touring virtual locations; creating and browsing 3D libraries; offering options for those with disabilities or the elderly through adaptive technologies; immersion; scaffolding; simulations; modeling; global reach/openness to other cultures; language learning; peer-to-peer teaching; experimentation and discovery; a “safe place” to house treatment for those with social anxiety and other disorders, including extremely shy students; the teaching of electracy, literacy of modern electronic modes of information; experience as “other” race/gender/victim/etc; rapid prototyping; clothing/architecture/etc design; digital exhibits; virtual performance; special interest groups/communities; virtual mini-campuses to orient students before visiting the real one; self-paced tutorials; historical re-enactments; treasure hunts; and 3D models. Obviously, there would be no way for one area to take full advantage of all of the potential uses. However, in an exemplary example of a tutorial or training center in SL™, there should be several affordances used. Section B includes the various dangers or potential pitfalls as discussed earlier. There is no way all could be guarded against—however, users should be able to see design and management choices to reduce the risk. Also, many of the items in this section include real-world issues—designers of purely inworld training areas would have little control over these. However, educators designing a course in which SL™ would be used would need to know of these potential risks and plan accordingly. Listed, the potential pitfalls and dangers include: griefing; need for powerful hardware; need for lots of bandwidth; grid downtime/ “Black Wednesdays”; firewall issues; lag; inconsistencies of performance, depending on the machine used; identity confusion/lack of trust models; culture shock; learning curve; expense for virtual land; lack of standardization between grids/worlds; necessity for new classroom management techniques; inappropriate behavior amongst students; security issues; “It’s just a game” mentality; constant viewer upgrades; navigation for visually impaired students; cartoonish appearance; “Seedy underbelly”/bad reputation of SL™; staffing for a 24/7 environment; insufficient variety of resources; restrictions of the Linden Scripting Language—LSL; lack of scalability; lack of much empirical evidence of success rates; lack of visual cues/body language; Linden Labs incompetence/inconsistency; lack of transferability of SL™ skill set; lack of clear guidance from instructors for various reasons; unintentionally losing track of time; age restrictions; lack of creation ownership; visual clutter; difficulties of giving in-world feedback/assessing in-world activities; online addiction; time necessary to build a good in-world course; sexual harassment; and feelings of vertigo. From what has been learned from those who have used SL™ for educational purposes, a list of best practices can be established. These are separated into two parts—those to be done in the real world and design elements to be accomplished inworld in SL™. For those incorporating SL™ into a course, the designer would need to try to integrate items from both sides of the best practices section. However, for inworld designers, they have no control over real world situations of their user base, so the inworld side of the best practices section would be focused upon. Section C includes off-world/real world activities that are recommended as best practices to include in designing courses that include SL™. Listed, this would include: make sure campus technology is strong enough to handle SL™; firewalls and filters should allow SL™; buy-in from administration as well as support staff; budget plenty of time for design; require students to go through an orientation session prior to the class lessons beginning; prepare students for what they might encounter; tie SL™ activities directly to the course directives; make it clear to students why SL™ is being used and what is expected of them; match affordances to course requirements; give students feedback at regular intervals; supply students any training they may need to perform required tasks or allow them to access it; encourage snapshots to be taken for a visual record; use small groups for activities; match SL™ activities to students’ SL™ ability levels; be prepared with contingency plans; instructors must spend time in SL™ themselves; and organizers should know their limits on time and money and know what tools are available to make best use of both. Section D includes best practices that would be designed into inworld tutorials or learning centers. Listed, these include: clearly designated areas with easily understood paths with a minimum of distractions; “clean” design choices to reduce lag; information chunked and ordered in a way that makes sense; scaffolded information; clear directions; interactive exhibits; social spaces designed for congregating; presentation areas; library areas to house information; immersive design/simulation spaces; methods for user feedback to improve design; thoughtful theme to fit the purpose; sandbox spaces for learners to practice what they’ve learned; branding to assist in a sense of community; “living spaces” for members of the community; usage of group and announcement tools; “metagame” tools to allow for information to be shared out on the web; regularly scheduled events; information presented in a variety of forms; designed for accessibility/universal design; virtual tours; rewards/achievements for successful completion of activities; transcripts available for review; offer virtual office hours; management/leader contact info should be available; staff on hand to handle questions and/or griefer issues; individual sessions should be kept to 20-30 minutes to keep attention; and use text-based chat to encourage shy people to participate” (Weston, 2014). Context–In Spring 2014, I was asked to once again get involved with Oxbridge University (a tutorial/training center in Second Life that is one of the locations studied for my dissertation). 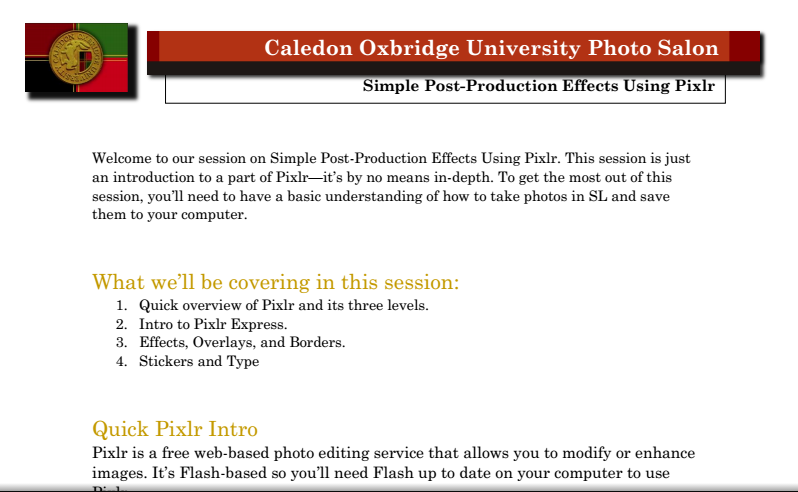 One of the instructors had stepped down and the administration at Oxbridge wanted to save the course, a lecture/critique salon on the art of photography in a virtual world. I joined a team of instructors who would each teach two weeks at a time (first week lecture and second week critiquing session of student work). 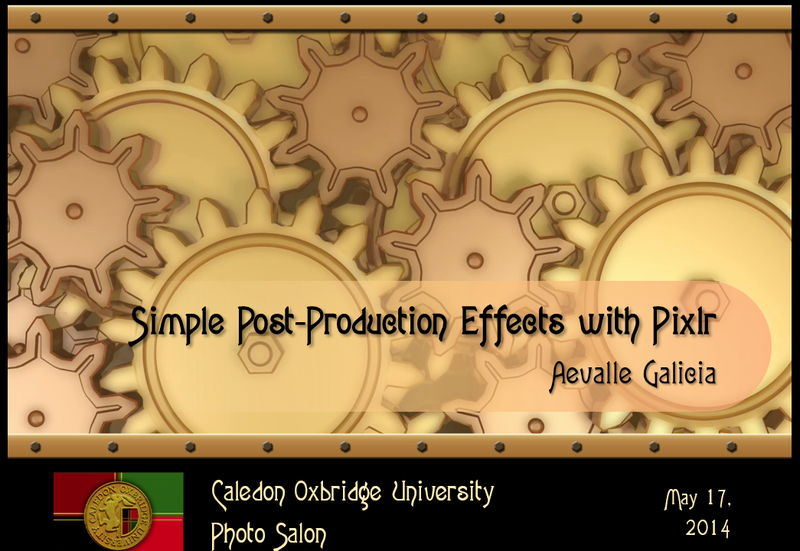 One of the lectures I put together was designed as an introduction to Pixlr for simple post-production effects. Reflection–I’ve taught Pixlr as part of a live workshop, but this was my first attempt at doing it virtually. Even though it was real time, I found it challenging because the learners couldn’t watch me walk through the steps. I simply had to explain it with still screen shots. I think in the future, time permitting, I’ll also put together some quick tutorial videos, showing the steps in real time of everything the learners are expected to do for their assignments. 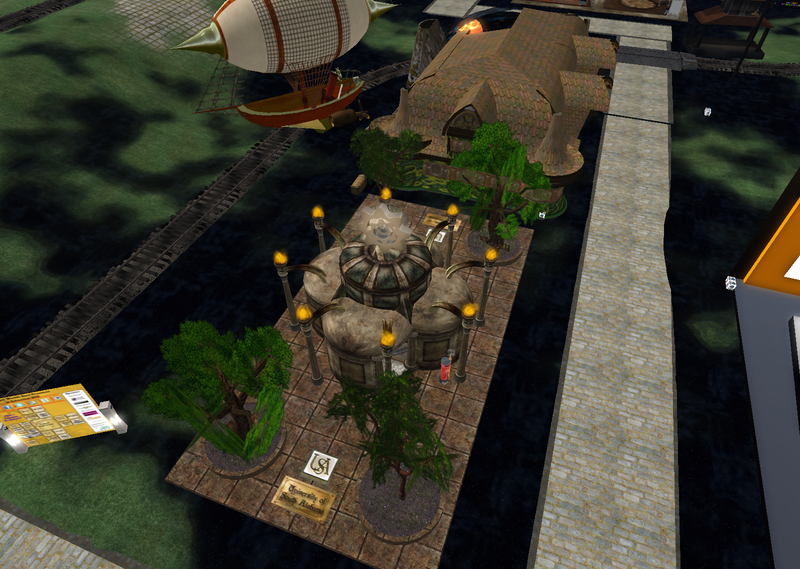 Context–Beginning in 2009, I began working with the Caledon Library System in Second Life, which is part of the Alexandrian Library System (a project based on the ongoing academic work of JJ Jacobson of the University of Michigan). The Caledon Library System focuses on themes related to the Victorian era. My role quickly became curatrix of the Spiritualism collection, as spiritualism and other occult themes were a definite driving force during the time period. On May 1, 2009 (Beltane/Walpurgis), the H. P. Blavatsky branch of the Caledon Library System opened. In it’s original location, I had over 200 full-text volumes available for perusal, as well as notes from in-world Spiritualism lectures and access to Spiritualist-based podcasts/lectures via streams from the web. Reflection–The project started off wonderfully, though big. With trying to keep up with adding new titles weekly, writing a newsletter for the branch weekly, and keeping up with questions from visitors, it quickly became a project that ate more hours than what I had time for. I’ve since scaled down the project. All of the original texts are still available in-world of via the database spreadsheet, but I only write up posts about it when I add new titles (which is now every few months, in general). Context–By 2012-13, with the Sakai migration fully in swing (and nearly completed), it came down to the Innovation in Learning Center to provide both step-by-step guidance for Sakai tools and other technologies as we as quick tips for both instructors and students. These tended to be done by individuals but were proofed and edited by others, making it truly a team effort to try to keep the university community up to date with the latest educational features of Sakai and other tech. Reflection–While I think branding is important, I think we spent way too much time on the packaging when the focus should have been on the product. The branding ended up being dominant in many of the meetings and discussions rather than the content. I took a lesson from that because I sincerely believe that, while materials certainly should be pleasing to the eye and fall in line with a “branded” design, the content should be the driving factor. Context–As part of the VWBPE MOOC after the 2012 conference, during the machinima week, participants were charged with creating story pieces with the theme of “Cowboys vs. Aliens” to show what they’d learned about the process of machinima-making. This was my entry for the week. Reflection–I, again, learned a lot about what not to do as far as scheduling and organization. We didn’t have a lot of time and, I think, my vision was a lot larger that what we realistically had time for and I had to cut back and make due. If I had to do it over again, I’d have actually storyboarded everything out, with the needed characters and created appointments with volunteers for shoots as well as gathering all that was necessary for each scene and arranging it in my inventory via folders. All of that said, considering this was a first effort of something more than “talking heads” and with the time constraints, I’m pretty happy with the outcome. 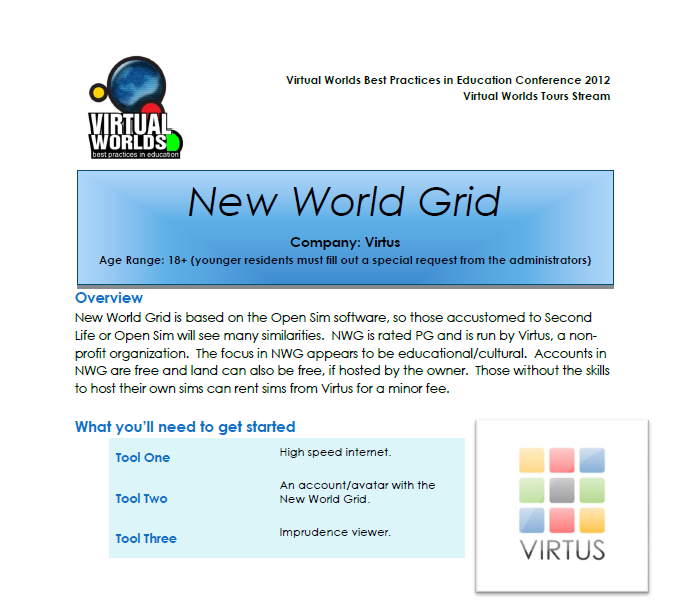 Context–As part of my internship with the Virtual Worlds Best Practices in Education conference in 2012, I put together training materials to allow people to participate in the tours and presentations in grids and games outside of Second Life. Many of the attendees either had never ventured outside of Second Life or their experience was minimal as they only attended events such as virtual conferences and their skills had faded. What was needed was something quick and simple (and short) to get them signed up and prepared to follow along on the tour or interact with the presenter’s materials in a selected virtual world or MMORPG. Reflection–I would’ve really liked to have had these available to conference attendees a lot sooner (they went up only about a week before the conference). We held off, thinking that there may be some changes made in the worlds/games and, sure enough, EveOnline changed their orientation for new users only 4 days before the conference (so the packet had to be reworked). I intentionally left off a lot of graphics to show users exactly what to click in order to keep the page numbers down, but my preference is to include more of those instead of less. Below is a handful of the mini-guides done for the conference. 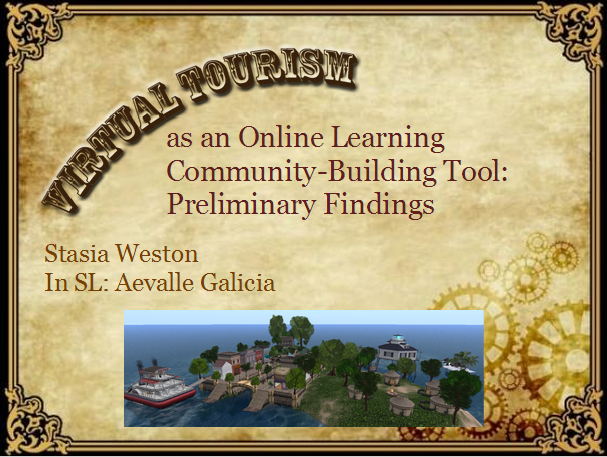 Context–When I had a presentation accepted for the Virtual Worlds Best Practices in Education conference in 2011, I was thrilled at the opportunity to speak on the lessons I’d learned over years of conducting virtual tours in Second Life. Then I found out that the year’s design theme was “steampunk” and I saw the chance to really have fun with the set-up and packaging of the information. Reflection–I really enjoyed the virtual format and being able to construct an environment (albeit small) that supported my ideas. I think I may have spent a bit too much time on the design of the building rather than the presentation design (my belief was that, with the presentation being processed differently on different people’s machines, I needed to keep it simple). That said, people remembered my presentation and asked that I put it in Google Docs and share it publicly so that they could refer back to the advice. My presentation area also set up enough excitement that I set a personal record for turnout for a virtual tour (“Steampunkery and Lifelong Learning”), which was also accepted as a presentation with the conference that year. I had 68 individuals show up for a two-hour tour. 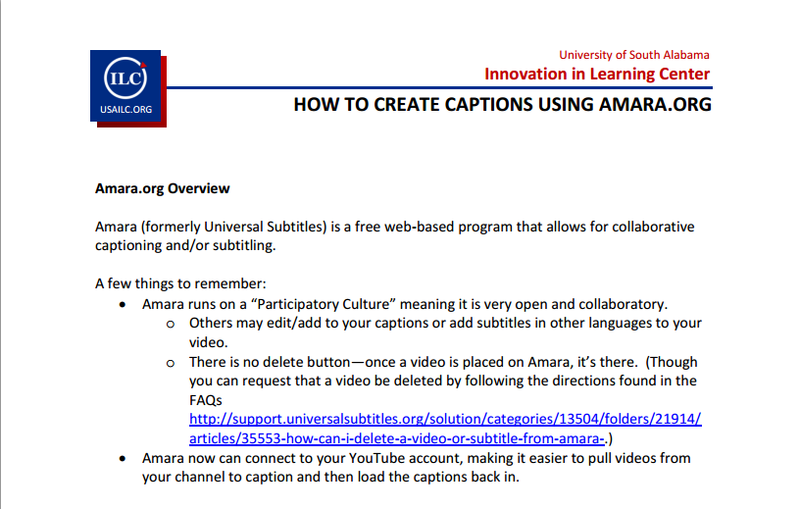 Context–When the University of South Alabama decided to migrate from eCollege to Sakai, the decision was made to create training in multiple formats as well as supporting video series, showing examples of best practices on a variety of technologies. In the early eLeaders series, I was asked to do some of the voiceover work because of my background in radio. Reflection–In the earlier videos, I was not involved as much with the production as I was so involved in virtual worlds but, eventually I stepped up to take over as team leader for the video team, working with our full time videographer. Context–During the course of the 2007-08, I was honored to be selected to be the official OLLie blogger for the Online Learning Lab. The assignment was to publish 1-2 high quality blog articles per month that would be entertaining and useful for our faculty. 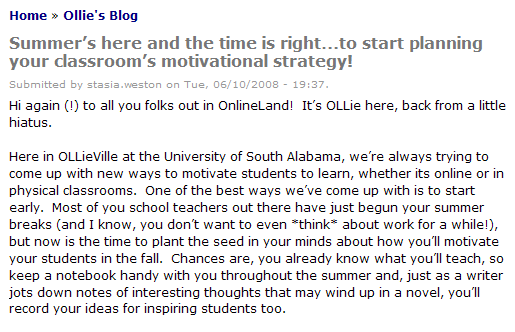 Below is an example of one of the blog posts from the summer of 2008. Reflection–Though the blog was phased out when the OLL went to a wiki format, the old blog is still getting hits 2 years later. I’ve learned since to walk a fine line between having timely topics and those that are easily outdated. I’ve also learned that my own interest and excitement about a topic I’m covering actually does come across to the readers, so even now when I’m posting on my own blogs, I try to find angles or resources that make me sit up and say “wow!”. If it interests me, chances are, it’ll interest someone else. I hope that sincere enthusiasm still comes through in my older OLLieblog posts. Context–When the Online Learning Lab and College of Education launched USA’s Jaguarland in Second Life, we were excited to let everyone in the university who was interested in teaching in SL know about it. Not many even knew what SL was, much less had thought of it as a teaching tool. Dr. Jack Dempsey, Rebecca Reese and I decided to form an interest group. 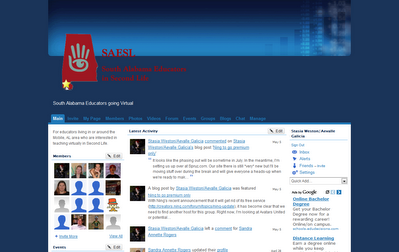 The South Alabama Educators in Second Life group found a home on Ning and quickly began expanding. From it’s inception in October 2009, we’ve held a handfull of group meetings and an in-world virtual world meeting with guest speaker, Marty Jencius from Kent State University. I took on the lead for the group in late fall 2009, having built the Ning. 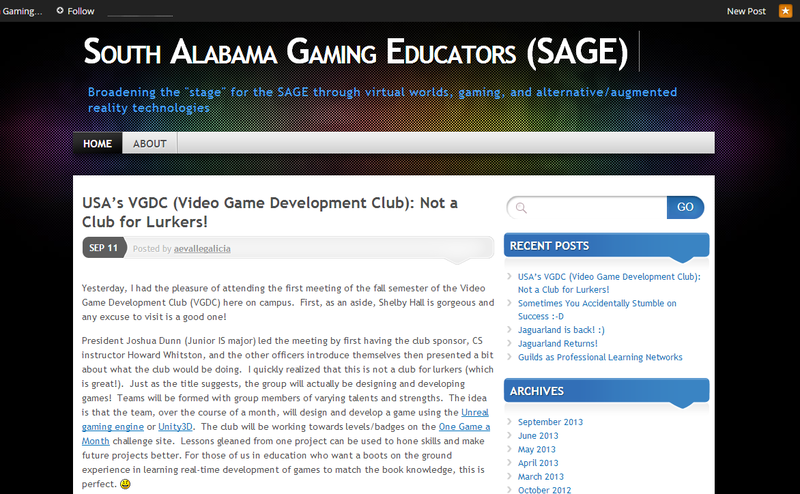 The group later was moved to WordPress and morphed into South Alabama Gaming Educators (SAGE) as interests in edugaming expanded. Reflection–Getting interest rolling for a new technology is always difficult, I think. With SL, the learning curve throws a lot of instructors who are new to it. After quite a bit of interest at first, we’ve whittled down to a core group who are quite active in SL. I’ll keep the group running for them to have a forum to discuss issues or interesting tidbits. We had to move from our Ning that some of us used regularly. We have a new WordPress site (as of 2013) that is currently being built up. Context–In Summer of 2009, I took a “University Teaching” course in which we were given the opportunity to do hands on work in developing course units, both online and non. We also had the chance to take our lesson plans and materials into the classroom. I taught a 3.5 hour Friday evening course in American Literature. 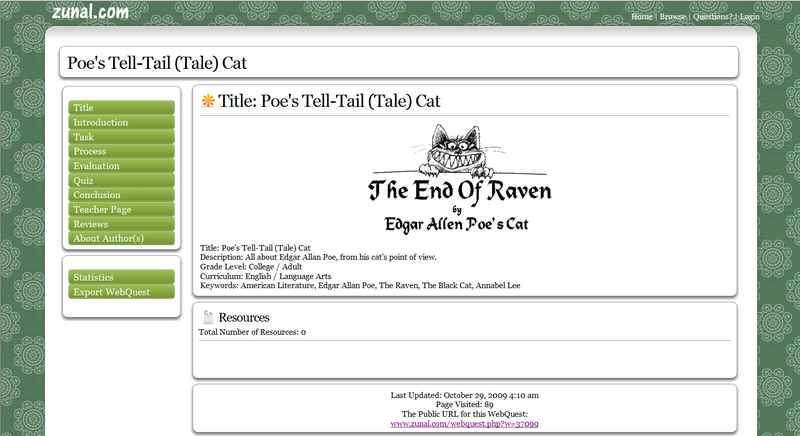 The Webquest below went with the class on Edgar Allan Poe, which just happened to fall on the night before Halloween. Reflection–After several attempts at creating a webquest using Dreamweaver and HTML (and it not looking how I wanted it to! ), I stumbled onto an online service known as Zunal and fell in love. It’s a bit quirky, yes, but I found that it’s library of webquests offer instructors choices to add to their courses without their having to “reinvent the wheel” as it were. For those of us who need to create our own, the given format means that the developer can spend more time on content and less time fussing over how the page looks–a real time and headache saver. Context–When the USA Course Redesign movement really began to get rolling in late 2009, early 2010, committees began being formed to handle the transformation. Many of these committees did not know that the Online Learning Lab existed, much less what our jobs were. We consultants were asked to produce mini-movies of what it was that we did in and for the Lab. Reflection–When I put together my part, I knew most of my work recently had been done in Second Life, so I decided to try my hand at moviemaking (or machinima) in Second Life. It was a learning experience. I realized I definitely need to look more into filming in-world as a tool for education. While I’m satified with my accomplishments in Second Life, I already realized after making the movie that I needed to go back and refresh my knowledge base in other technologies. 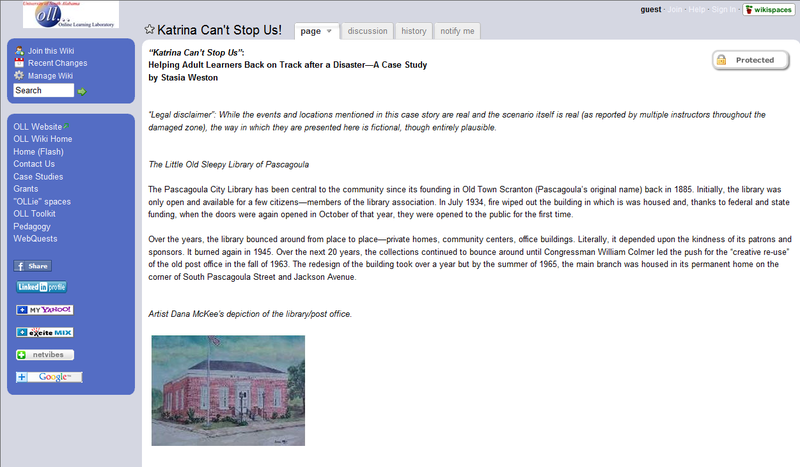 Context–In Fall of 2006, a year after Katrina, I took a course which discussed using Case Studies and Stories as a means of training. I decided to try my hand at writing one. The Case Story below is the product of that class. Reflection–I really did enjoy writing the story, even though emotions were still running strongly. The community had still not recovered from the storm. I tried to use tools gained from my creative writing courses to flesh out the story to make it more real. What I found is that, while creative writing techniques add flavor and interest, they can also add things that are unneccessary. There is a fine balance to be made between keeping a reader’s interest and adding unneeded words (which cost money in publishing) and information (which can be confusing to students).